Archos ARCDisk40 - Nice, but Slow! To make it short: The ARCDisk40 is very small, very well built, but the ATA to USB 2.0 bridge is way too slow and cuts down the performance to 7.35MB/s. The harddisk itself could provide an average transfer rate of 15.7MB/s across 12 media zones from 19.5MB/s to 10.8MB/s. In the meantime there are special external enclosures available for the 1.8" Hitachi drives that do not limit the transfer rate. Because the PCB is soldered directly to the pins of the harddisk, the ARCDisk has a size bonus of about 10mm. But the limited transfer rate cancels out the size advantage, and even the solid enclosure with the rubber protection cannot compensate the lack of performance. Upgrading the Archos Gmini 220 with the 40GB harddisk by just inserting the larger harddisk is not possible. This does not work due to the additional height of the 40GB model. Even if it would be possible with certain modifications of the riser card holding the 44-pin socket, it is still unknown whether the current firmware would accept a larger disk. Shortly after I bought the Archos Gmini 220, I saw the Archos ARCDisk40 advertized in some online shop. There were already rumors about a Gmini 240 using a 40GB Harddisk, and Hitachi had such disks, but there was no infomation available on the Archos website. Well, yesterday I received the disk. I wanted to confirm that it really was the 40GB model before unpacking it, but there was not a single hint on the package. Only after unpacking the disk, you can read the model number at the bottom of the case. OK, that was enough storytelling, now for the important facts. The ARCDisk is really small, but very solid and well made. The case is built into a rubber frame, which attaches directly to the harddisk base with four special Torx screws. The four corners of the rubber frame extend a little so that they act as rubber feet. Like this you can gently put the disk on a hard surface without worrying about the disk. Connected to the USB 1.1 port of my notebook, the disk starts without any problems. Because my IBM ThinkPad X30 has no built-in USB 2.0 ports, I have to use the IBM CardBus USB 2.0 adapter. Because of the very conservative current limiter in the adapter, the disk does not spin up when connected to the USB 2.0 port. This might apply for a few other USB 2.0 adapters, too. But using the USB 2.0 port of a desktop PC at work, the disk started up without any problems. The power supply is not really a big deal. For such purposes, the ARCDisk has a power jack for an external power supply. But the power supply is not included, it is only available as special accessory. The Voltage of 5V is already mentioned in the brochure. I only had to figure out the polarity. As power supply you need an AC adapter providing 5V. The disk is specified at 0.5A, but I would recommend at least 0.8A. You need a plug with an outer diameter of at most 4mm, the inner pin of the power jack has a diameter of 1.3mm. The power jack should accept any plug with an outer diameter between 3.5 and 4mm and an inner diameter of 1.3-1.7mm. The center pin is positive, the outer shell is ground. If you have a huge collection of gadgets, you should be able to find an appropriate power supply. The power supply of the Gmini 220 does not work, I still have to figure out why. After I found a matching power supply, everything worked fine - at least at first glance. As a next step, I wanted to run a benchmark using the native ATA interface of the harddisk. I never trust those USB bridge controllers. Disassembling the case is very easy, if you have the appropriate screwdriver. After I opened the case, I experienced a bad surprise: The controller PCB is soldered directly to the pins of the harddisk. By the way, the interface is a standard 2.5" 44-pin ATA interface. 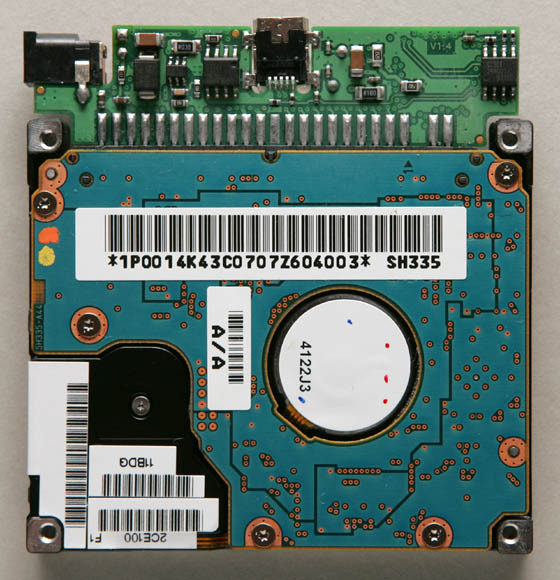 The 1.8" Toshiba harddisks use a 68-pin PCMCIA interface. For those who already counted the pins: The separate four pins are for the Master/Slave/CS jumpers. Those prophets who phantasized about soldered Microdrives in the MuVo² must have mixed up their visions. Maybe they smoked the wrong grass. Now for the really bad news: The USB bridge controller from Cypress seems to have a serious problem with data throughput. Two independent benchmarks on different computers resulted in an average transfer rate of 7.35MB/s. The 20GB disk used in the Gmini 220 has an average transfer rate of 15.7MB/s with media zones from 19.5MB/s to 10.8MB/s. Because the 40GB disk is simply a two platter version of the 20GB disk, the transfer rates should be the same for both disks. A disk transplant of the 40GB disk into the Gmini 220 will be difficult for two reasons: First you would have to unsolder the bridge PCB from the disk and remove any remaining solder from all pins. That should be no problem if you know what you are doing. But for mounting the disk in the Gmini there's another challenge: The 40GB disk has an additional height of 2.5mm. Because of the mounting position of the disk, these 2.5mm extend towards the inside, where the battery is located. This means that you would either have to change the stacking order of disk and battery, or you would have to rise the 44-pin ATA socket. Even if one would succeed in doing these modifications, it is still unknown whether the current firmware would accept a larger disk. These facts don't make this project attractive. Here are two photos of the ARCDisk without the shell. 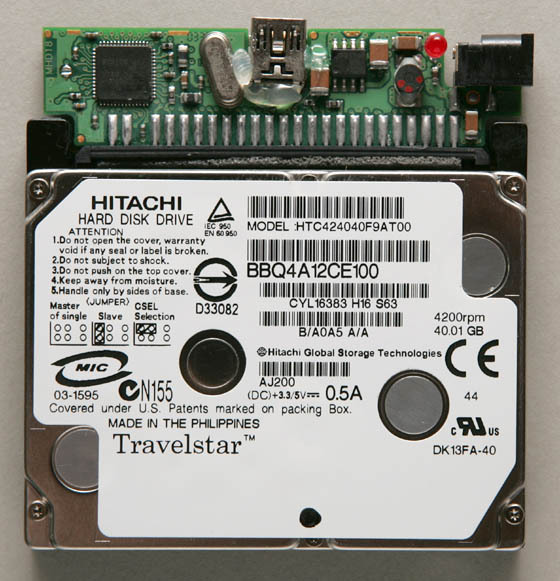 The harddisk is a Hitachi TravelStar C4K40 "HTC424040F9AT00 DK13FA-40". The controller is a Cypress CY7C68300 "EZ-USB AT2™ USB 2.0 to ATA/ATAPI Bridge".